I have never been big on simulation type games for some time. Ever since SimCity2000, I had given it a rest. Never bothered with the Sim's titles, anno, civilization, and the only Tycoon I bothered with was the Rollercoaster series. I am aware that the Anno series most-likely has a very similar concept around what Banish pulls off: Anicent village/town/city building with a focus on economies/trade rather than conflict. Not knowing anything about this game before, I had stumbled upon it and downloaded it and there is one thing that struck my attention with this game the moment I started a city. It was the shear DIFFICULTY of survival! I've played other games where it feels like you get your hand held with whats going on all the way. This is the first simulation game that has held my interest in a long while due to how brutal it is. 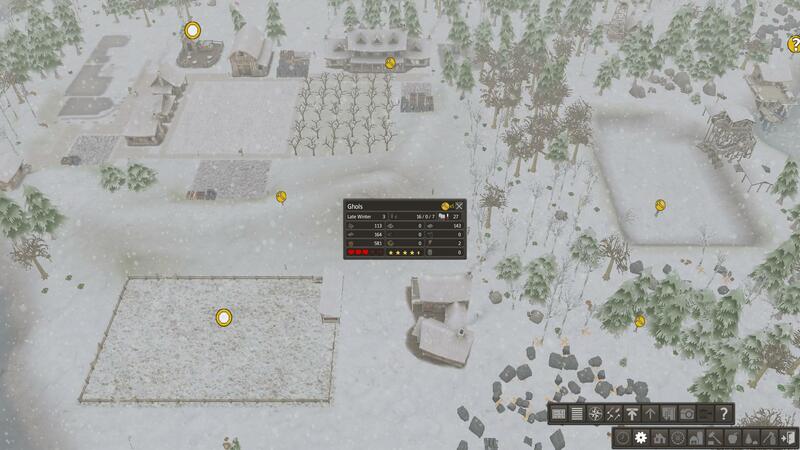 Even on the normal difficulty with the weather set to "fair", the climates can take a toll on your village. Resources like Tools, Coats, Firewood are all very essential to having your villagers not die off. 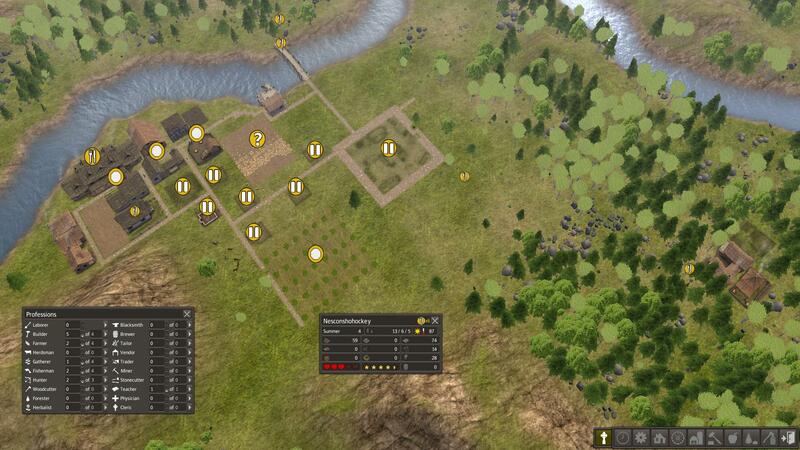 After a few days of playing, the biggest villages I have built have not lasted very long and my population dwindels. Every attempt at building a striving town has resulted in me learning something new about what I am doing wrong. Job management is one of the trickiest tasks to undertake and I love how vital every little thing is. Nothing is handed to you. Observation: First attempts at learning. Focused on reasources and didn't know about the finer things like tools/coats/firewood. Hence why everything looks dead. And people are wandering around without tools! Demise: Tooling shortage = major underdevelopment issues. Gave up early, took some basic survival tutorials, then proceeded with some experience. Observation: My most successful of towns. Screenshot was of an early stage before it grew much larger in size. Qurries, markets, tools, food was all in very high supply. I even stopped food production because I had way too much, however with the amount of villagers, it didn't take long to have the food numbers plummeting and with time needed to replant seeds and gather. I almost, almost lost it. Demise: Thought I could live on temporary housing. Untill I realized that people were not reproducing. By the time I realized this and started moving people into their own homes to have kids. All of the populations age was approx 50-70 years old. They weren't having kids and the population died off. Lesson learnt: It pays to have some dedicated laborers to run food around and distribute. People like privacy and their own house to raise a family. Demise: Starvation. Health problems due to lack of heat / long winters. All before I could gain new teenage laborers. Buildings were part of the plan, but labourers had to quickly become hunters/gathers in order to fight food/heat issues. But it was too late. You need to keep your kids properly nourished and at school so that you gain villagers to use. All while making sure the health of the older villagers is good so that they don't die off early. Once you discover a hole in your plan, you have to quickly plug it with only a few villagers to work with and you are basicly juggling to survive. Once 5+ people die. Good luck coming back from that. I am sure the game gets easier once you push past the initial survival period. Last edited by MetalSutton on Mon Apr 07, 2014 8:38 am, edited 1 time in total. Hah good review. I like this trend in games becoming more difficult, or more punishing for failure. Nothing makes you pay attention more than a swift slap in the face, but on the other hand, nothing feels more satisfying than triumphing over real adversity. You don't ever feel that kind of satisfaction when the reality is, you haven't been challenged. 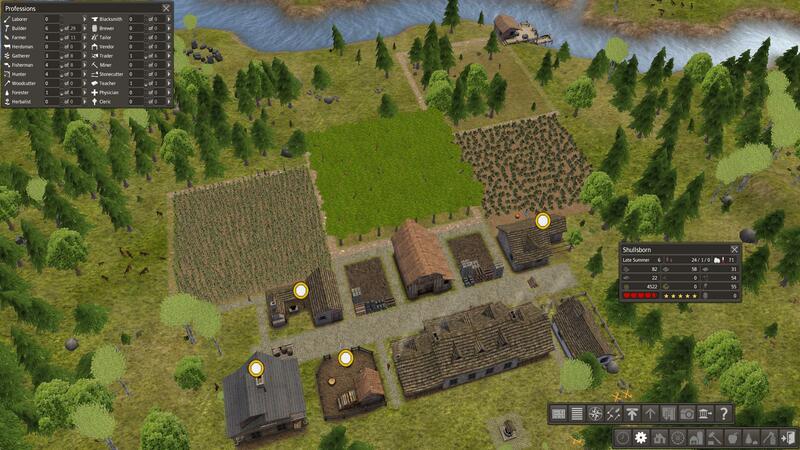 I'd read that with this game, there's no real purpose - ie no endgame outcome, beyond creating a thriving village. But from what you've written, i think it's pretty obvious that's the meat of the game. Listen to Totalbiscuts opinions on the difficulty. He just goes on and on. Its true that the greatest thing about this game is the ongoing desire to just make a functioning village. Which is why I kept attempting at getting better, it is NO easy task. While it is true that there is no goal or end game, It has been 3 days of long play sessions and I still haven't accomplished even one achievement. I usualy play it on x2 speed, but recently I am confident that I can roll on x5. However during a winter or some resource lull, I need to pull it back so I don't die off. x10 only when everything is in place where it needs to be, but then it doesnt take too long for things to go back out of sync. The developer is looking to release more content soon. It's like the Settlers - have you played that? THere was one a year or two ago - graphically beautiful game, where your only really goal was the same - to raise a thriving city etc. But holy crap the difficulty - it was initially easy, but you'd always end up with these absolute cunty supply chain problems. Was a very enjoyable game though - i do reccomend it. Firewood economy stronk. Too stronk. Only build Stone houses, make forest nodes, then trade firewood for everything. Game needs more depth. I quite like it tho.